Please add comments. Thanks for visiting! 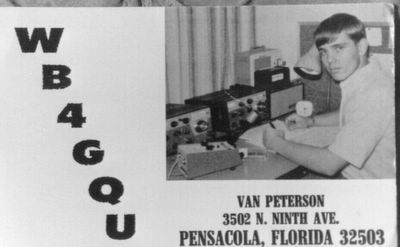 Circa 1969 "Ham Radio" QSL postcard. "QSL" is the radio signal meaning: "I am acknowledging receipt.". Hams send these cards to each other in the snail mail after they make a radio contact. This is a "picture" QSL postcard which showed off my rig. My station was an American made R.L. Drake "C line" with R4B and T4XB receiver and transmitter. This rig allowed me to contact stations around the world. Also in the picture is a Heathkit "electronic keyer" which was primitive and prone to errors but made higher speed morse possible. Also visible is a Heathkit "twoer" VHF transciever that put out about 1/2 a watt on 145Mhz AM. With a homebrew 7 element Yagi antenna I routinely worked stations in Fort Walton Beach, Florida about 40 miles away with the "twoer". The microphone you can barely see was from an Ampex reel to reel tape recorded that I lifted from my dad's Hi-Fi system. It worked fine. Also visible is an electric 24 hour clock (in front of the "twoer") set to GMT. Coordinated Universal Time (UTC) is the international time standard. It is the current term for what was commonly referred to as Greenwich Meridian Time (GMT). Zero (0) hours UTC is midnight in Greenwich England, which lies on the zero longitudinal meridian. Universal time is based on a 24 hour clock, therefore, afternoon hours such as 4 pm UTC are expressed as 16:00 UTC (sixteen hours, zero minutes). Some military refer to UTC as "zulu time".